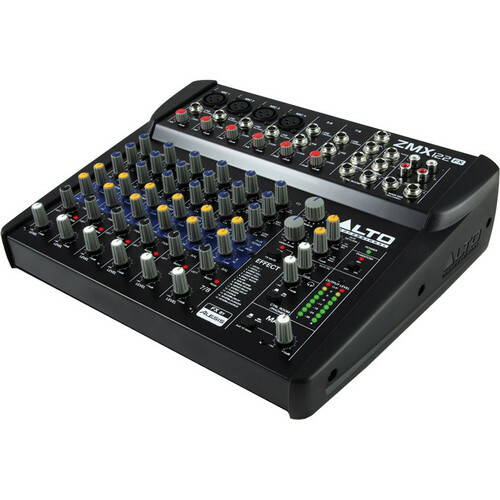 The ZEPHYR ZMX122FX from Alto Professional is a compact, 8-channel audio mixer with 256 built-in digital effects presets, featuring inputs for both microphones and line-level signals such as drum machines and keyboards. Four of the channels feature balanced 1/4" TRS inputs, as well as gold-plated XLR jacks and microphone preamps, and two balanced 1/4" TRS stereo line-level channels are also provided. All six of these channels feature 3-band EQ, Pan, and Level knobs, as well as two Aux Sends. One of the Aux Sends is labeled for external monitors, and the other is dedicated to sending signals to external effects. The two Aux Return inputs, combined with the stereo RCA Aux inputs, make for a total of 12 input channels. The ZMX122FX also features two bus outputs: the Main Outputs and the Control Room outputs. Stereo RCA outputs are also provided. Box Dimensions (LxWxH) 15.4 x 12.7 x 5.8"
ZEPHYR ZMX122FX 8-Channel Mixer with Effects is rated 4.5 out of 5 by 2. Rated 5 out of 5 by Tracking Man from Excellent addition to my gear set!! The recent purchase of my ZEPHYR ZMX122FX was to expand the number of inputs to my DAW. My interface has only two inputs, I had been using a small mixer to add lines-in mixing these down to two, but the unit was too noisy for recording purposes. The Alto ZEPHYR ZMX122FX has even more inputs plus a far better noise floor, plus the unit is still built in a small footprint. I had to wait until B&H received additional units before I got mine, but the wait was worth it. also the price was low due to a sale. I'm very satisfied. Rated 4 out of 5 by Burl_Whit Trio from Right size and price. Haven't plugged it in yet... but why I bought it? The price, 8 channels, compact, built in effects (reverb), No sliders to take up space.